IMPORTANT: Since we first supplied these balls in 1986 there has been a notable diminution of the requirement for rubber coated balls. This means that it is no longer viable for us (or others - one USA competitor has pulled out) to supply from stock a wide range of products. In general, we now make to order, with a lead time of not less than 4 weeks. This may shift the emphasis to uncoated balls, where the lead time is typically 7 days. Function: To act as fluid diverters so that active ingredients such as acids or proppants are diverted from a high flow area of perforations to a low flow area so that the low flow area gets the treatment. Used with coil tubing and in other downhole squeeze applications. Materials: Benoil's consist of a core based on epoxy resins with suitable light- and heavy-weight fillers to achieve the desired specific gravity. 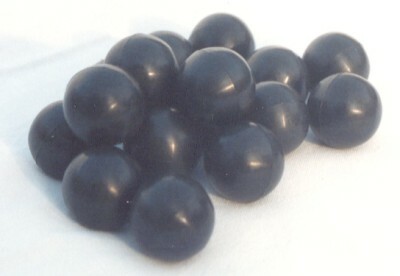 Balls may then be overmoulded with either nitrile or fluorocarbon (eg FCR) rubber. Not all diverter balls are so covered however. Nitrile coated balls are suitable for use to approximately 100°C or for short periods to 120°C. FCR coated balls are suitable for use to approximately 180°C - the limitation is not in the FCR but in the epoxy core. Other materials could be used, such as phenolics or nylons etc, but the volume required has never warranted our manufacture. There are many possible epoxy resin combinations. The standard series are based on room temperature curing systems. We can also use a hot cure resin which takes longer to process and is more difficult to handle. The latter has a higher Deflection Temperature under Load (up to 140°C rather than 96°C), a higher recommendable operating temperature, and a better compressive strength. Because the balls are highly filled systems, their values are not those of the unfilled resins; and because the composition is different for each ball size (in the coated series) and for each specific gravity, we have not undertaken the determination of exact values. We have used the hot cure system for the FCR coated balls, and could use it for uncoated balls, if the application justifies it. Please ask. Identification: We formerly colour coded to identify SG fractions, but when these were refined to 0.05 this became impossible as the range expanded. We have renumbered this section as it has been expanded. We can make to any required practical specification on request, subject to determination. We now list SG values to 1.95; we could produce higher values if ever required. If rubber overmoulding is required, this adds considerably to time (and cost), whereas we can produce, and have produced, uncoated balls within a few days. We will produce only a few if requested, but at proportionate cost. The largest so far produced is a 3" diameter uncoated drop ball of SG 1.2; the lightest is a nitrile coated ball of SG 0.8 and the densest a Viton coated ball of SG 1.8. Testing: The pressure test to which sample balls have been subjected involved loading 125kg on to 3 cores sandwiched between 2 metal plates at ambient temperature for 24 hours. The contact area was estimated, and thus a pressure was estimated at greater than 10000psi. The balls showed no deformation damage other than a slight flattening at the contact point. However, it has also been claimed that, when squeezed against an orifice, the ring of deformation damage on a coated ball caused by a pressure of 3000+psi was enough to prevent perfect sealing when back- floated and then refloated into place. These are not incompatible results and uncoated cores not subjected to the heat and pressure used in moulding are, probably, stronger. Not only that, but the forces in the two tests are not exerted in the same way and it is possible to show theoretically that greater damage is likely for a ball squeezed against an orifice. Indeed, because of this difference, it is not merely the compressive strength which matters; ball cohesion also reflects the tensile strength, though not in simple fashion. Further, the size and nature of the orifice considerably affect the likelihood of damage to a ball. We therefore recommend that, where possible in use, a substantial safety margin be allowed for after due calculation of the geometry of the system. If this understanding is relevant in your well development, please ask and we will try to indicate the optimum system. Sizes: We list the finished ball diameter in inches and its specific gravity. While all ball sizes have a full range of SG in the uncoated form, this is not so for coated balls. The amount and density of the rubber coating prevents the creation of the lower SG balls with any strength in the smaller sizes; borderline vales are marked *** and incur a premium. Prices: These are given in the paper catalogue for quantities of 200 upward in units of 25 or 50 packed to order, otherwise in 100s. If you want fewer than 200, that is possible; a single special uncoated ball has been made, as have 3 or 4; the price in such cases has to cover all the relevant costs.